The Legal department of TOS serves as a knowledge centre for internal purposes and for our clients. We consider it to be part of the TOS services to provide advice with regards to applicable legislation with a special focus on labour law, maritime law, tax law, social security regulations, etc. Together with our operational department, we strive for the best possible solutions within the limits of the law. Compliance and transparency is one of our core company values. At this page, you will find an up-to-date list of our certifications and you can learn more about our services. Your privacy is important to us. If you trust your personal details to us via our website, your personal information will be processed in accordance with our privacy statement. Within TOS we highly value our employees. We always do our utmost to provide the best possible employment solution for the job. This will be depending upon the location of the work, the duration of the project, the requirements of our customers, etc. For all our employment solutions you can rest assured that we provide fair employment conditions, including but not limited to an adequate insurance package. Compliance with all applicable legislation is one of the foundations on which we have built our company in the last decades. We are transparent in our communication regarding your employment. TOS operates on the basis of its own general conditions. You can download these general conditions simply via the link below (scroll down for English version). Transport & Offshore Services Binnenvaart B.V.
Transport & Offshore Services Crew B.V.
Transport & Offshore Services Energy B.V.
Transport & Offshore Services International B.V.
Transport & Offshore Services Ship Delivery B.V. The internatinal Safety Management (ISM) code is an international safety management standard for the operation of ships and the prevention of environmental pollution. Certification is proof of the ship’s technical quality and the qualitative aspects of management. >> Certificate ISM St. Vincent TOS Ship Delivery B.V.
>> Certificate ISM Panama TOS Ship Delivery B.V. The ILO’s Maritime Labour Convention (MLC), 2006 has been created to improve the working conditions for all 1.2 million seafarers worldwide. The Convention aims to prevent unfair competition in the maritime industry and sets out a basic minimum package of seafarers employment conditions. All ship-owners must be able to demonstrate that their crewing agencies are operating in compliance with MLC, 2006. >> Certificate MLC2006 TOS Crew B.V.
>> Certificate MLC2006 TOS Energy B.V. The NEN 4400-1 certificate is becoming increasingly important for you as recipient. By working with an NEN 4400-1 certified agency, you minimise the chance of additional assessments from, for example, the taxman. TOS has a G-account which you can use as recipient, in which case you are protected against the risk of liability for payroll taxes and VAT. >> Certificate NEN 4400-1 TOS People On Demand B.V.
>> Certificate NEN 4400-1 TOS Crew B.V.
>> Certificate NEN 4400-1 TOS Logistics B.V. The TOS Onshore and Work2Learn Division is SCT certified. SCT is the abbreviation for Safety and Health Checklist Temporary Employment Agencies. It is a quality mark. The implementation and enforcement of the SCT procedures minimises the safety risks for staff. >> Certificate SCT TOS People On Demand B.V. and TOS Logistics B.V.
>> Dutch certificate VCU TOS People On Demand B.V. and TOS Logistics B.V.
TOS has been accredited by the Belgian government to deliver services as employment agency in Belgium (Flemish region). The accreditation offers us the possibility to employ personnel on ships that sail under the Belgian flag or on ships that sail exclusively in Belgian waters. >> Erkenning België – Vlaamse Gewest TOS Crew B.V.
AUG-Erlaubnis means Arbeitnehmerüberlassungsgesetzes Erlaubnis, which is German for Temporary Employment Permit. This permit offers the possibility to employ personnel on ships that sail under the German flag or on ships that sail exclusively in German waters. >> AUG-Erlaubnis TOS Crew B.V. 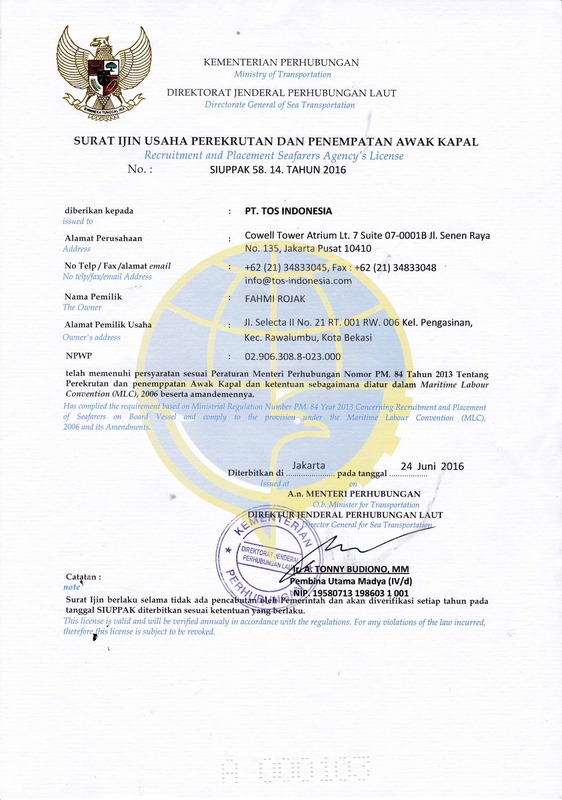 Issued by the Indonesian Ministry of Transportation for placement of Indonesian Seafarers onboard vessels under the Maritime Labour Convention (MLC) 2006. Climate Neutral Group helps organisations reduce the climate impact of their business. Since 2017, TOS compensates the CO2 emission of all flights of her onshore and offshore crew worldwide. Compensation takes place through the specially selected sustainable energy projects. In 2017 and 2018 the contribution of TOS was invested in an onshore wind farm in India. TOS is committed to an anti-discrimination policy. Should you have any questions, comments or complaints regarding this anti-discrimination statement, please contact our Legal Department or your contact person at TOS. Additionally we would like to draw your attention to our complaints policy, which is stated on our website. TOS is continuously in the process of improving her services to you. We consider every complaint as a free advice. Therefore complaints will be analysed and solved in accordance with the TOS internal complaints procedure. You can send your complaint to complaint@tos.nl. It is also possible to deposit your complaint by phone, email or letter at your regular TOS consultant. Please state clearly on any correspondence: REFERENCE: COMPLAINT. A complaint by email to complaint@tos.nl will be confirmed of its receipt immediately. If you have deposited your complaint per letter, you will receive a written confirmation (by email or letter) of the receipt of your complaint within 2 working days. If you have deposited your complaint by phone, you will not receive a written confirmation. TOS does its utmost to solve all complaints within 5 working days after receipt of the complaint. If the complexity of your complaint does not allow this, TOS will notify you about this within 5 working days. With this notification you will also be informed on the time needed to solve your complaint in a satisfying manner.